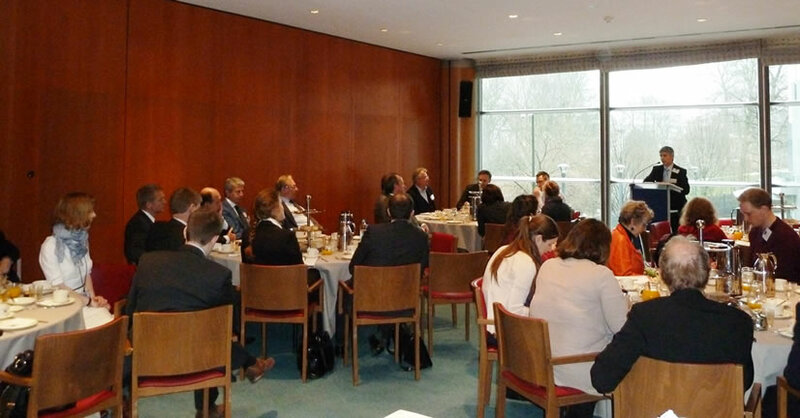 The European Re-refining Industry Association (GEIR) invited policy makers, stakeholders, journalists and NGOs to a European Parliament breakfast discussion on waste and recycling in the framework of upcoming EU waste policy revision. The review of the Waste Framework Directive focuses on waste prevention measures and the introduction of recycling targets for additional waste streams. The Member of the European Parliament’s Environment Committee, Mrs. Christa Klaaß (Germany, Conservatives) opened the discussion giving a general outline on the importance of waste management and recycling for the EU’s emission savings targets. Keynote speaker, Mr. William Neale from the Cabinet of Commissioner Potocnik, discussed whether environmental legislation is a burden on economic growth and outlined the EU Commission activities to foster a green single market. Businesses need predictability for their investments underlined Mr. Neale. GEIR President Dr. Detlev Bruhnke (Avista Oil AG) presented the association and elaborated on the environmental, economic and social benefits of future recycling targets for waste oils. “Waste oil regeneration is a good example for green job creation and our members are worldwide technology leaders” said Mr. Bruhnke. GEIRIn addition, Mr. Joan Marc Simon, Executive Director of Zero Waste Europe gave an overview of the civil society perspective on waste and recycling: recycling targets per waste stream could be a good instrument to ensure coherent EU waste management. Recycling rates are stagnating despite putting into the place the EU Waste Framework Directive. Following the presentations an interesting debate took place where Members of the European Parliament requested industry to provide policy-makers with more data in order to support policy-making. GEIR members outlined that most waste oils are burnt due to the economics, as tax cuts are subsidizing incineration and not recycling. Click here to access the list of participants present.